Famously, author William Faulkner wrote, “The past is never dead. The past is not even past”. A fellow-novelist, Briton L.P. Hartley, wrote around the same time, “The past is a foreign country: they do things differently there”. Which is true? They both are, it just depends what the topic is. In the 19th century, much – never quite all – of the medical profession viewed alcohol as a valuable aid. Hence we see an illustration of L.P. Hartley’s thinking, since things are very different now. But in the 1800s, whiskey was listed in the U.S. Pharmacopoeia, the official compendium of drugs that may be prescribed and ingested for treatment. Whiskey, or Spiritus Frumenti (spirits of grain), remained there into the 1900s including during Prohibition when whiskey could be obtained under medical prescription. Doctors were not blind to the abuses of alcohol, and deprecated them in strong terms, but many nonetheless viewed alcohol as useful in the clinic, emergency room, and household. This was so even for children, it is not hard to find instructions to give babies a few drops of bourbon for various problems, and later, a teaspoon for tots. It seems insane now, but was a regular practice and it lived on in folklore. I recall being told by locals in Kentucky that their gums had been rubbed with whiskey in infancy. None of them was an abuser of alcohol, incidentally. Today, alcohol is never prescribed or advised by doctors and its use by society in general is cautioned against constantly. There has been some suggestion in the last generation that the moderate use of wine can assist heart health. This is controversial: many doctors think the risks outweigh the benefits, a stance that would have puzzled most Victorian practitioners provided the consumption was moderate. Moderation was defined in different ways, but formulas such as a pint of beer with meals or a dram of diluted spirits were not uncommon. 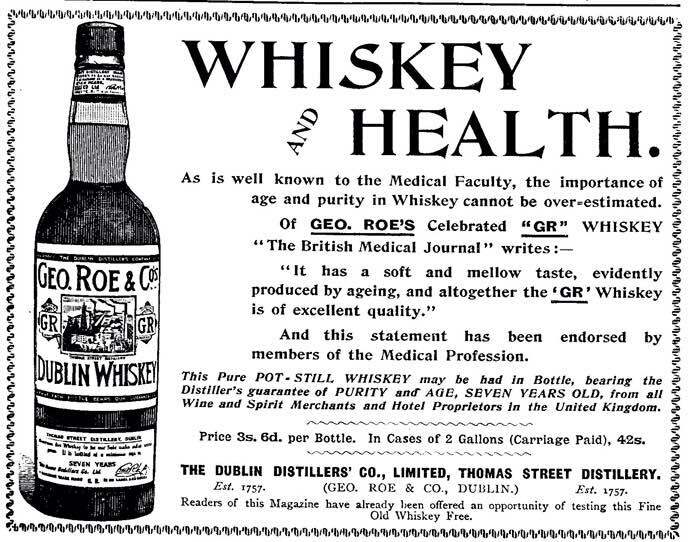 After all, this was a period when whiskey brands were advertised in medical journals. The indulgence or credulity of physicians was assisted by a number of factors. First, there was no sulfa in this period. No aspirin. Anaesthesia was in its infancy. Few effective drugs existed. Opiates existed, but they were highly addictive and often counter-productive. Life expectancy was short. The quotes which follow are from an article in 1884 by Dr. John Octerlony, A.M., M.D. He was Professor of Obstetrics and Diseases of Women and Children at the Univerity of Louisville. The article was published in The American Practitioner: A Monthly Journal of Medicine and Surgery. Indeed, it shows that medicine was a different country then. When the stimulant effect of alcohol is required, especially in cases of acute disease, or in sudden emergencies, good whisky or brandy is to be preferred….That form of alcohol which in our opinion is best suited for general administration to patients in this country is the so-called Bourbon whiskey….While all Kentucky whisky, made by honest distillers – and these are many – may in general terms be counted as good when of proper age, that known as “sour mash” Bourbon whiskey is esteemed by most persons as the best. It is claimed to be the softest and most purest – to continue to improve the longest, and as it ripens to develop all the better qualities of the old Cognac brandies. It is used medicinally in Kentucky to the exclusion of almost every form of alcohol, and it is so used because experience has taught that it is, both in flavour and digestibility, and as a stimulant, fully the equivalent of the finest, oldest and most expensive brandies. Thus we have a highly-skilled doctor vaunting, not just the whiskey of Kentucky for medical purposes, but the merits of genuine sour mash. Its “flavor” and “digestibility” did not escape notice, and in another part of the article, Dr. Octerlony was careful to approve, not just any sour mash, but one aged 4-6 years. If you read him quickly, you could be forgiven for thinking he was a whiskey connoisseur with a sideline in writing for the retail market. 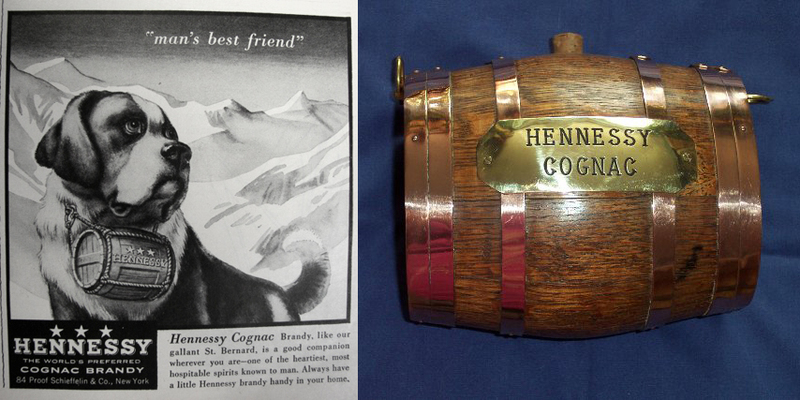 Is it possible that the deep purses of distillers were used to buy favour from doctors? We can’t rule it out, but I don’t think that was the case here. Dr. Octerlony’s beliefs were shared by too many of the Faculty, both in North America and overseas, to suggest a general vitiation in this sense. No, this was the zeitgeist, or rather its zenith, since the 1880s were the high-water mark of favourable medical opinion on alcohol. 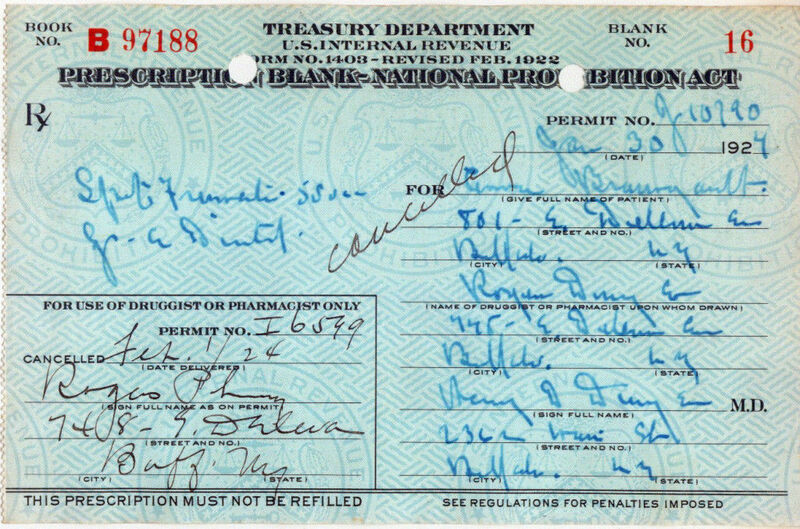 The license given doctors to prescribe small amounts to patients in the Volstead (Prohibition) era was a last gasp of the time when whiskey or brandy was thought useful in medicine. Still, even our resolutely modern temper retains the old idea that alcohol can be good for you, or a quick-fix. The St. Bernard dog going to the rescue with his keg of something strong is still an instantly identifiable image of beneficence with a curative or therapeutic undertone. In a future posting, I will draw attention to doctors of the time who were less robust whether the pint of aged sour-mash should be part of the doctor’s medical arsenal. Note re images: the first image above was sourced from this retail packaging design site. The second, from this ebay listing. The third, from this vintage ads site. All trademarks shown are the sole property of their owners or duly authorized licensees. Images shown are believed available for educational and historical purposes. All feedback welcomed.